Air Classification is the process of separating particles according to the settling velocity in a gas. 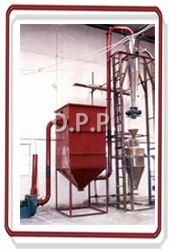 Air Classifiers are used to separate dry materials into different particle size fractions by their size, mass or shape. Air Classifiers are used to modify a particle size distribution, remove the fines fraction of a material or the over size or coarse particles of a material or create two grades of material. 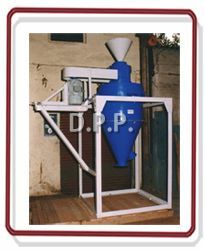 The D. P. Air Classifier is a compact and dust tight machine for fine classification of various powdered materials. The air classifiers are ruggedly constructed to high engineering standards to give long reliable service life to the most arduous duties. 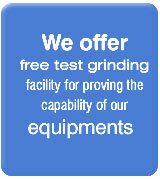 Low operating speed ensures that wear and tear is minimised when handling abrasive materials. Easy access to the interior of the machine for inspection and cleaning is ensured by the provision of generously proportioned inspection doors. The rotor is mounted on heavy duty antifriction bearings which are located outside the machine and protect them against ingress of dust. Due to self contained nature of the machine all air flow is contained with the boundaries of the machine. In the cycle of operation, material enters the centre feed pipe and drops upon the rotating distributor plate below, which disperses the material into the upward sweep of circulating air developed by the fan in the top chamber of the drum. The whizzer blades set up a centrifugal motion of the air and material. This concentrates the oversize material along the surface of the upper inner cone, where gravity causes it to flow into the lower inner cone and then out the tailings spout at the bottom. The air stream carrying the powdered material of required fineness moves through the fan and is delivered into the outer cone chamber where the fines are discharged as finished product. After the fines are released in the outer cone, the air returns through the deflector ports to the inner cone, setting up a continuous circuit. The D.P. Air Classifiers are used for a wide range of applications e.g. 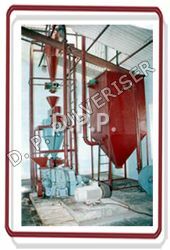 Cement, Limestone, Soya flour, Hydrated lime, Food Products, Chemicals, Talc, Clays, Metallurgical Powders, Pigments, Fly Ash, Silica, Aluminium Oxide, Graphite, Calcined Magnesite, P.V.C. Resin, Asbestos, Barytes, Quartz, Feldspar, Coal, etc. Strong construction of mechanism and casing ensures long life. Close control of over product uniformity. Minimum loss of fines in the tailings. Special liners are available for processing abrasive materials.